The most effective way of developing the skills and requirements of fencing is through individual lessons with a coach. In order to provide for this, Adam Blight in conjunction with Sheffield Buccaneers Fencing Club, offers the opportunity for fencers to receive individual lessons and train on Saturdays and Sundays from 8.00am till 1.00pm at the Park Centre,Duke Street, Sheffield S2 5QP. This is directly behind the Duke Street library, the building has a very tall brick chimney which can be seen from a distance. 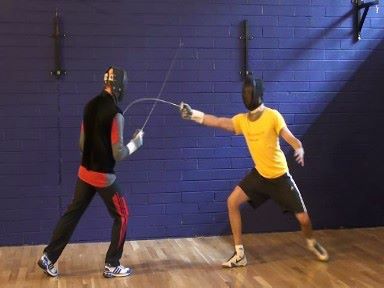 Those wishing to book lessons should go to – https://adamblight-fencing.com/individual-fencing-lessons/ and let Adam know their preferred dates and times from those available by email, phone or at club sessions. If other dates are required, this can possibly be arranged. The costs of lessons are – £20 for ½ hour, £40.00 for 1 hour. The venue is also available for those who wish to fence and electric equipment can be provided for this. If you wish to fence, you should let Adam know in order that electric equipment can be brought. Those who are coming for lessons should arrive with sufficient time to warm up and prepare. Also, if anyone fails to turn up for a lesson or cancels at short notice, they are expected to pay for the lesson. Many fencers who have received regular lessons from Adam Blight have achieved National and International success and these lessons have been essential to achieving this.